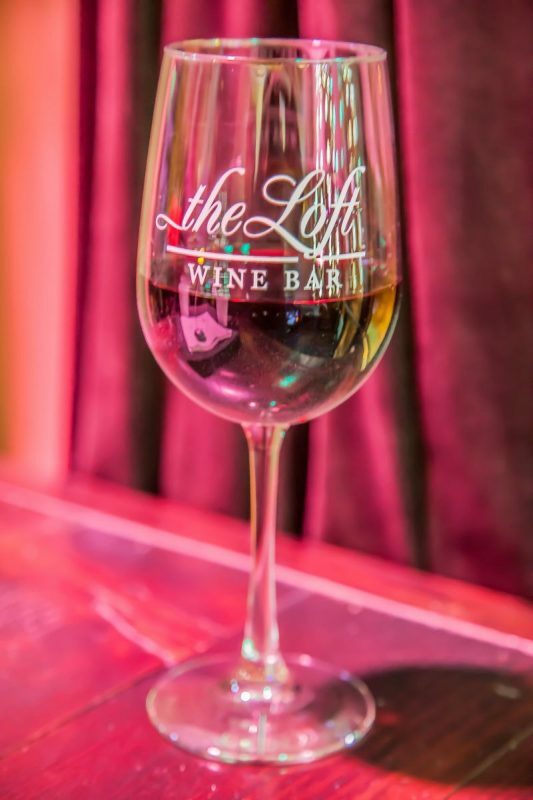 The Loft is a wine bar on First Street in the waterfront town of Benicia. I had visited there with a friend last year whilst California Girl was in Europe. I was eager to take California Girl, so that we could write about The Loft on this blog. Over the Martin Luther King weekend, we had that opportunity. California Girl comments: I have to apologize in advance for the weird pink hue on the photographs. The lighting in The Loft has that pink hue and it was impossible, without hours of Photoshop, to sit and remove the color. I did the best I could. 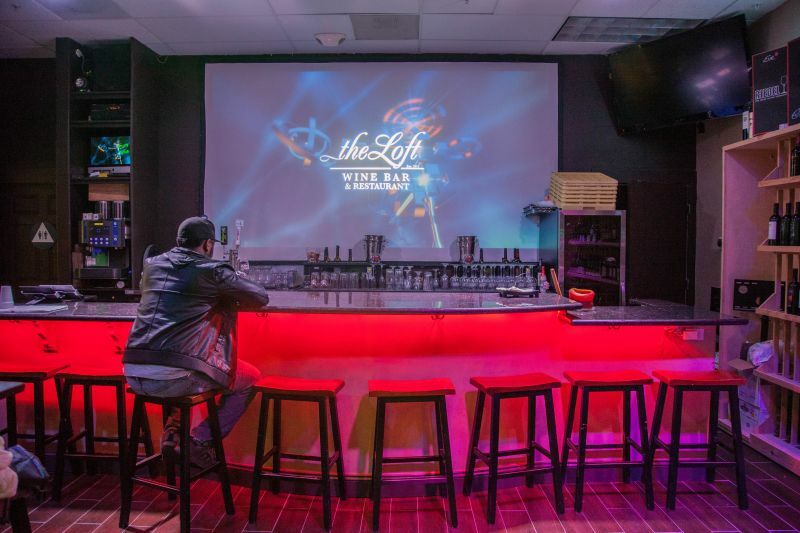 The Loft consists of a bar, a couple of high tables, and some sofas arranged around a coffee table; it is not a large, impersonal venue. There are three screens, two of which are usually showing sport; the third is located behind the bar and shows abstract swirling patterns in sync with the music. California Girl Comments: Bijoux would be a good word for this place. It is tiny and intimate. When we were there, we saw a couple sitting on the sofa’s obviously enjoying a date night in the intimate setting. The wine list is one of The Loft’s great strengths; offering a wide range of mainly Californian wines that deliberately keep away from the well-known names. Most of them are offered by the glass with a variety of prices from the affordable to special occasion. Our friend, who introduced us to the wine-bar, loves the white Grenache; an off-dry, soft, fruity wine which was recommended by Jason, the owner, as a suitable choice for her tastes. I enjoyed my first glass; a Petit Verdot from Mendocino, but it was left in the dust by my second glass; a red blend called Complexity. California Girl comments: I really enjoyed my glass of Complexity. I agree with The Brit, it was a great glass of wine that paired well with food, or was great to drink on its own. Complexity is a Bordeaux blend from Amizetta in Napa Valley. 65% Cabernet Sauvignon, 30% Merlot, and 5% Cab Franc. The nose was a touch underwhelming, or at least it was when compared to the explosion of jammy fruit that erupted with the very first sip. The profile was more reminiscent of a Zin than the conventional blend of Bordeaux grapes. The wine lives up to its name and is a good example of the care with which Jason curates his wine list. 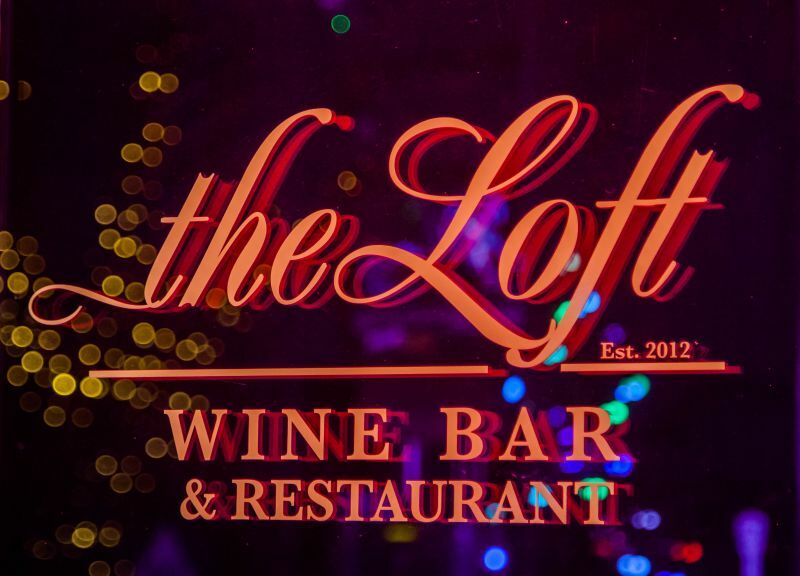 The menu at The Loft consists mainly of small, simple plates; ideal for sharing over a long conversation and enjoyment of several glasses of wine. However, the dish that made me so keen to bring California Girl back stands in stark contrast to those tapas like items; it is a Beef Wellington. 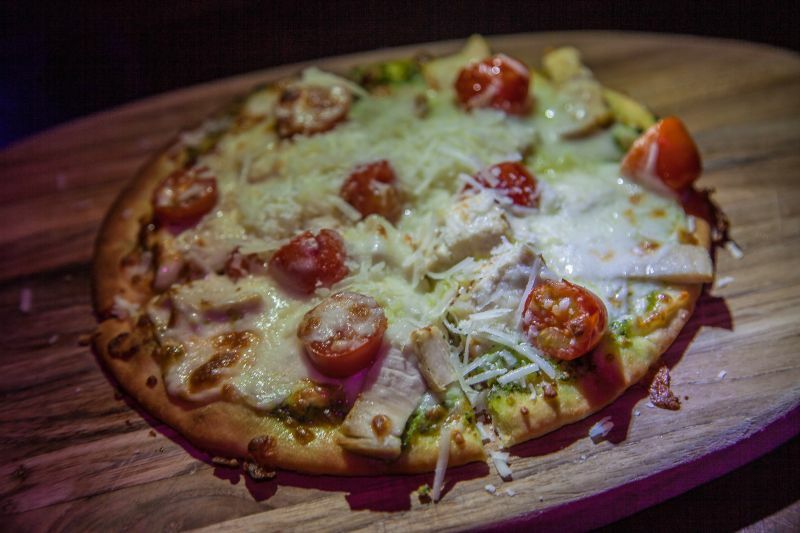 California Girl comments: The flatbread we chose as an appetizer to share was pesto with chicken and cherry tomatoes on top. The crust was crispy and light and the toppings had a lot of flavor. The green pesto with the pop of red cherry tomatoes not only made it delicious, but beautiful to the eye. 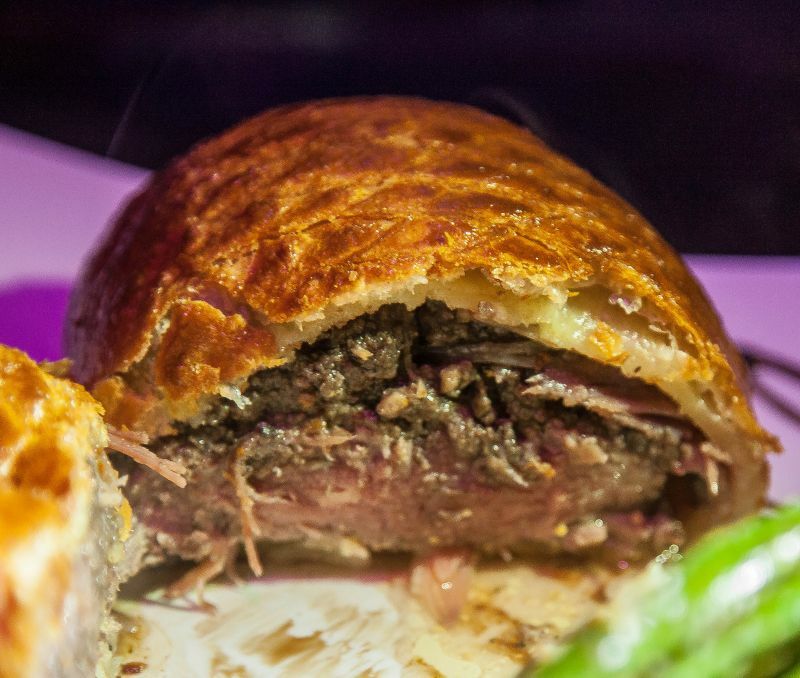 For those unfamiliar with the dish, Beef Wellington is a piece of steak baked in puff pastry. This is a meal that my Mother used to cook and I have not seen it in on a menu in the US; so I had been excited when our friend had said it was on offer here. My expectations and memories were not disappointed by the execution; beautifully cooked beef in a pastry that is crisp on the outside and softly soaked inside by juice from the meat. California Girl comments: I too enjoyed the dish. The meat was perfectly cooked and melt in the mouth. The duxelle (mushroom stuffing) was really flavorful, and the cook on the pastry was wonderful. It was a lovely golden brown color all over. They also managed not to get the bottom of the pastry a soggy mess. Great job. It was served with perfectly spiced garlic mashed potatoes and asparagus. The asparagus was a little over cooked, but not enough to make me be disappointed with my plate. 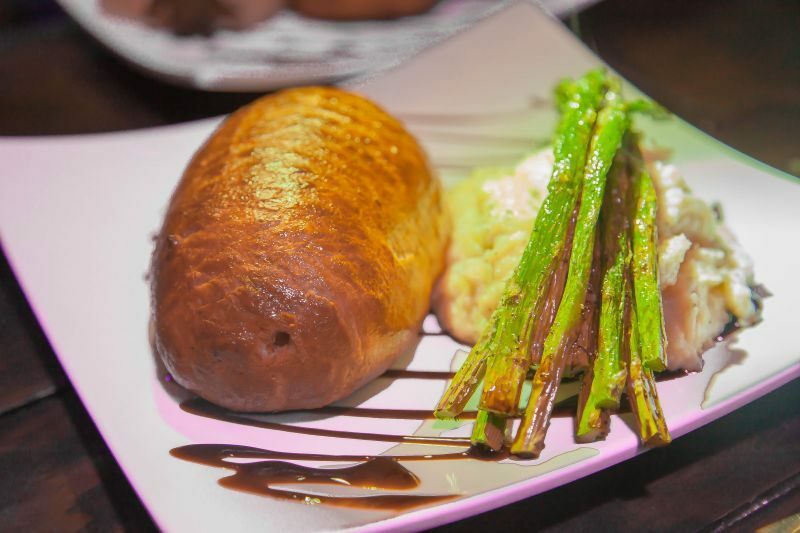 California Girl comments: Beef Wellington is one of their special dishes that isn’t always on offer. If you want to make sure that you get this dish, call in advance and see if you can order it. They are running a special over the entire of Valentines weekend where they are offering it. 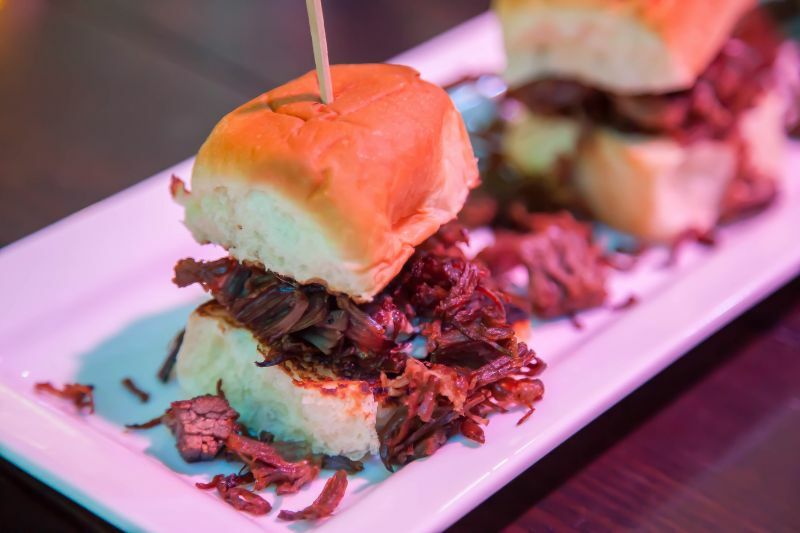 Make your reservations now if you want to get in on this deliciousness. Seats are limited, so I would suggest you get your reservation in early. The Beef Wellington is a dish to share; we had two between four, which with the flat-bread starter left us barely able to consider dessert. 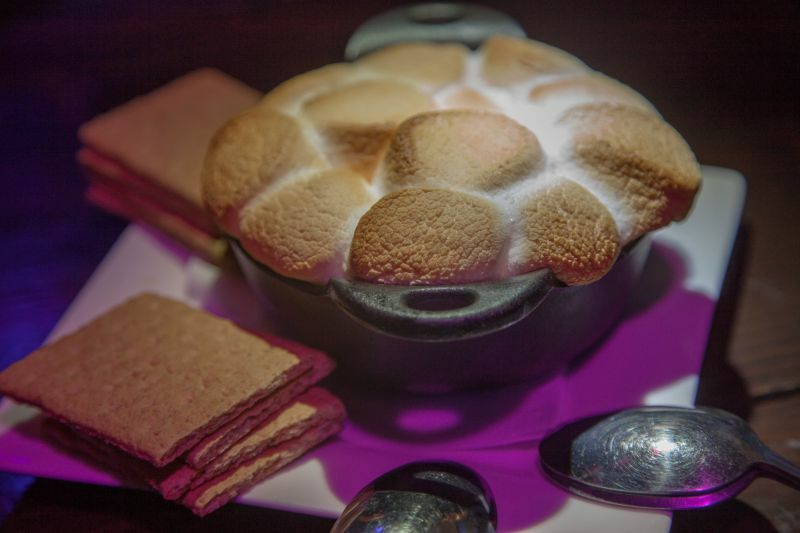 It was only our dedication to our readers that forced us to order the s’mores dip; a dish that offered melted marshmallows and rich, dark chocolate. Our lack of appetite when the dish was served was not evidenced by the empty dish that we left. Jason then brought us his other favourite dessert; chocolate/banana bombs. We were still protesting that we could not eat another bite as we stared at a second clean dessert plate. California Girl comments: Not only did we order the smores dip, but we added chunks of banana into it so we could call it our healthy option dessert. No one was fooled, especially the waistbands of our trousers that got suddenly uncomfortable. The dessert was so decadent. Smooth, dark chocolate on the bottom, with banana chunks in the middle and finished off with perfectly browned marshmallows. You use the graham crackers to dip into the goodness. Actually, we were all so greedy we used spoons to shovel as much of it as we could onto our crackers. Mmmm. I couldn’t even stick to my one bite rule. I have to interject the comment from one of our other diners about this dessert and the one that followed. She had happily dug into the first dessert heartily and was patting her stomach and making moaning noises of being too full. When the waitress brought the second dessert she looked up at her and said; “There is no way I could possibly eat any more dessert… Please get me a new spoon!” Ha, she managed to dive into the second one with gusto. The banana bombs were great. 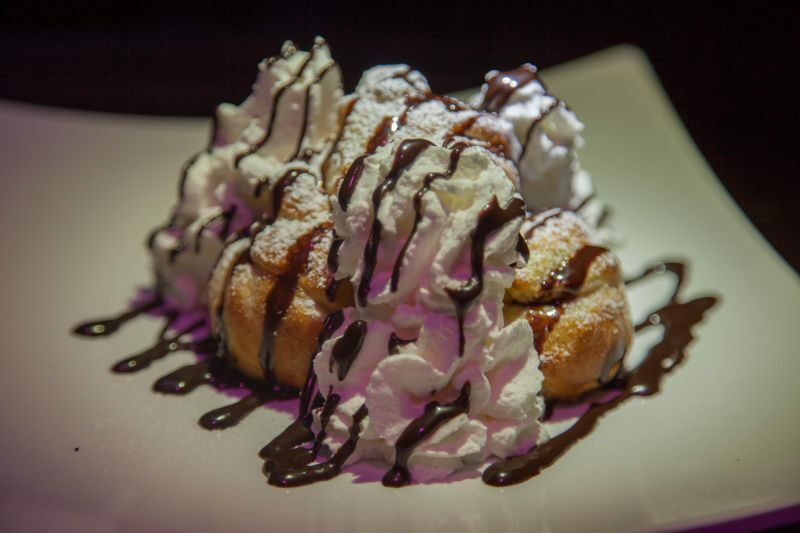 Puff pastry wrapped bananas smothered with whipped cream, and chocolate sauce. HOLY COW. It was good. I think I liked the s’mores slightly more, but if I were to do it over again, I’d be happy with either choice. Remember: The Beef Wellington is not a regular part of the menu, so if you wish to try it you need to ring and ask if it is available. Jason did say that he was planning to have it available for the week in which Valentine’s Day falls; so go ahead and get your orders in. California Girl Comments: We would recommend you check this place out. Good food, good wine, and nice staff. I think it will be even nicer when the weather turns warmer and you can sit outside on the patio and enjoy your glasses of wines and tapas in the sunshine.